does the weather app update on its own yet or does it only update after manually updating the weather app on the springboard? that is dumb if it still doesn’t. I prefer Intelliscreen also. 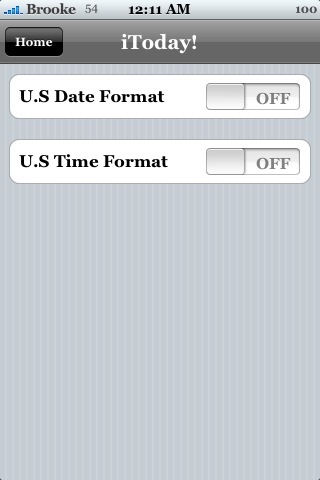 I like having RSS feeds and my calender on the that screen. My weather, RSS feeds, and Calender take up all of the bottom part. I wish Intelliscreen would put icons for missed phone calls and SMS Text Messages on the right and left of the time (Just how many texts i have, not a preview, I do not like the SMS preview). I like intelliscreen!!! I love to see the news, the weather, and so on…. HEEEE!! Help….when you ‘ve installed the itoday, you won’t see it back in the installer..and YOU CANNOT UNINSTALL IT!!! I try in the install section and you could INSTALL AGAIN?!?! ….yes..it download and ….Strangely you can’t install (of course! again man!!) …and when you go out….NO more the icon …that means..you cant even control to switch it off….i try to go to the FINDER and see….no you can’t activate it neither….anyone have the same issue?! So, right now iToday is uninstalled in Installer but you still is it on your lock screen? Do you have OpenSSH installed? You can always SSH in and manually delete the application. I have installed and uninstalled this application may times without an issue. 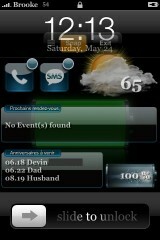 jeah, intelliscreen+ucallendar would be just awsome! I’ve nerver installedd itoday, cause I am afraid of it. Everyone keeps complaining about its issues. I don’t want to restore my iphone. 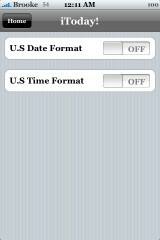 I am using intelliscren that works pretty fine, otherwise I’d like to see the callendar in my lockscreen. Is it true that Itoday can put a video runnig in your lockscreen? If yes, vwallpaper is necessary too? Guys thanks for letting me know about Intelliscreen, this application rocks!! The news feature is great i can see myself using that everyday.. even if it does cost i dont mind payin for this application, even though i am against paying for apps..
Hey brooke if you read this message, when is the next pod cast its been way over a month now, since the last one..
oh yeah..i could uninstall now …Thanks Brooke!! really quite disappointing this time to iToday….large files…(5Mb) and unstable…. intelliscreen’s last couple of updates have been excellent making it far more useful than iToday. it also just looks so much better than iToday; almost as if apple made it themselves. Does anyone know which application (iToday or intelliscreen) reduces battery life more? I had intelliscreen for a while, but it ate up my battery so I uninstalled. Is the experience with iToday similar? I like intelscreen cause its got more options! agree… i uninstalled intelliscreen straight away. i installed itoday and it didn’t show on the screen. I activated it but it didn’t do anything. Plz help! AppleiPhoneSchool is Feeling Much Better! !